There were a lot of things in Infrastructure NSW’s First Things First report that I didn’t like. Whereas the Transport for NSW Transport Master Plan tried to look at each transport corridor objectively, considered how it fit into the bigger picture, and then suggested the best possible solution for it, Infrastructure NSW almost seemed like it just wanted to build more roads and approached each transport corridor with that vision in every case. This idea needs to die an unholy death. I almost hate that I need to explain why this is such a bad idea, but here goes. The idea behind the underground bus tunnel is that light rail on George Street between Central and Circular Quay is flawed, and that a better option would be to link up buses that normally travel through the city and send them under the CBD instead. Light rail, the report argues on pages 97 and 98, would be incompatible with a pedestrian boulevard on George Street, and the presence of large numbers of pedestrians on the relatively narrow stretch of road would require light rail to run at slow speeds. Light rail would also require people to interchange from buses to light rail to travel through the city, and make trips that originate and end outside the city but are on buses that travel through the city require 2 interchanges (one at each end of the city). The report also argues that the bus tunnel would have a maximum capacity of 20,000 passengers per hour, compared to only 9,000 for light rail. 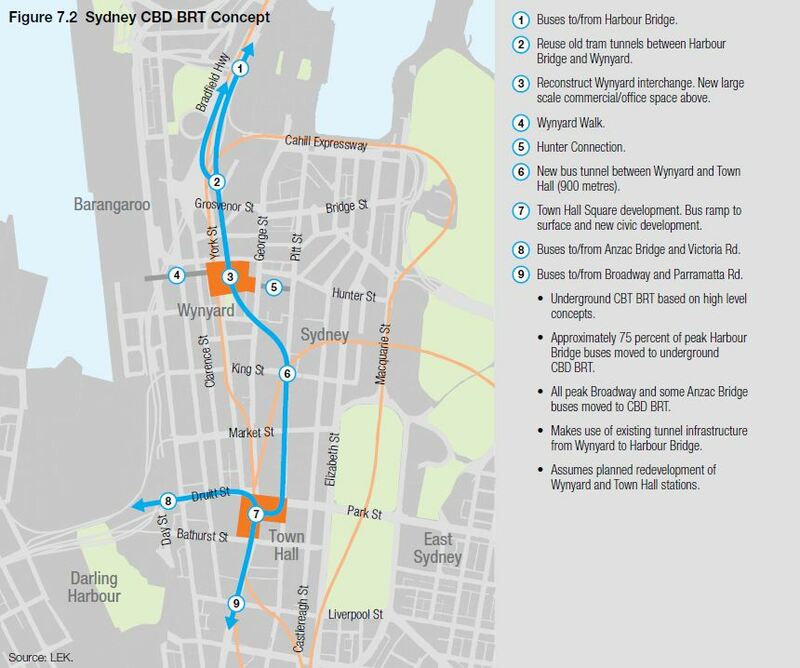 While the report generally does a good job of prioritising projects based on cost, this is the one exception where it has opted for a $2bn bus tunnel, rather than a $1bn surface light rail. To put that into perspective, for $2bn you could build light rail along George Street, extend the Northwest Rail Link to St Leonards to reduce interchanging problems at Chatswood Station, and build the Northern Beaches BRT through to Mona Vale. This plan also eliminates one major benefit that buses currently have, which is frequent bus stops that connect passengers with the streetscape. Instead, they will be required to get off at one of two super interchanges, then struggle to find a way to their ultimate destination. The last point appears to be the most dubious, the figures just look fudged. Brisbane’s extensive busways network (one of the largest BRT networks in the world) and underground CBD bus stations are cited almost as inspiration for this bus tunnel, yet the peak load for Brisbane is 9,000 passengers per hour (source: Harkness, 2003, page 4). Meanwhile, Melbourne’s tram network (one of the largest light rail networks in the world) sees 1 tram per minute travel along Swanston St during the peak hour (source: City of Melbourne, 2009, page 19), which at 300 passengers per tram (the same figure used in the report) gives 18,000 passengers per hour. That’s twice the capacity of BRT. In practice, the gap in the realistic capacity of BRT vs light rail is likely to be narrower, but the idea that BRT has a higher passenger carrying capacity than light rail in practice is fanciful. Now in theory, buses have an hourly capacity of close to 100,000 passengers, assuming one full bus every 3 seconds. This works on a freeway with no traffic impediments, but runs into trouble as soon as you start to need enormous amounts of kerbside space for passengers to get on and off the bus. This problem currently exists, particularly along York Street in the morning, where 600 buses enter the CBD via the Harbour Bridge each morning peak. The lack of kerbside space dedicated to bus stops (it’s about 200m at Wynyard and Town Hall) means you get a conga line of buses waiting for their turn to turn into the kerb and open their doors. That is the biggest capacity contraint at the moment, and is one reason why the government is trialling double decker buses (which have longer dwell times, but use up less kerbside space than the longer bendy buses). Yet somehow the bus tunnel plan would handle this better with 2 platforms, each 55m in length at each of Town Hall and Wynyard. In other words, it would halve the kerbside space available at the moment. This will not end well. The one good part of this proposal is the overhaul of Town Hall and Wynyard Stations that it also recommends. This part of the proposal should definitely happen, whatever ends up happening to the rest of it. 93% of all motorised transport each day is on roads. 81% of all CBD journeys to work each day are made on modes other than cars. The first makes it look like everyone drives everywhere. But motorised trips excludes active modes of transport like cycling (2% of trips) and walking (18% of trips), while also counting bus trips (6% of total) as road trips. The second, on the other hand, looks only at peak hour into the very dense core of the city, the part of Sydney with the best public transport links at the time of day when they are most plentiful. The first occurs mainly during the peaks, and mainly heading into dense activity centres. In these cases, the best way to reduce congestion, is to get more people out of cars and into high capacity transport. This is where public transport shines – predictable, twice daily large scale migrations of people to and from dense activity centres. You would need 10 lanes of road traffic for every track of rail to move the same number of people, so it just doesn’t make sense to make more roads the answer to this problem. The second occurs mainly during the off peak and for journey that start and end in low density suburban areas. Both of these tend to occur in areas and road corridors that have spare capacity, so not only is congestion less of an issue, but additional road capacity is not needed. Unfortunately, the Infrastructure NSW report does not make this nuanced differentiation, and instead lumps it all together, sees that there is congestion in the peak to dense activity centres on one hand and that car trips dominate travel in the off peak and to non-activity centre locations, then suggests that the answer is more roads. But in reality, in many cases, more roads are not the answer. The pro roads agenda can be seen best when any mention of public transport is almost immediately assumed to be buses. The report sees little to no role for rail to play in Sydney’s transport future. This should not be a road vs rail debate, each mode has its place and people who constantly argue for a metro or light rail even where a road based transport solution is a better fit are as much of a problem as those who advocate for roads. Had the O’Farrell Government not made the Northwest Rail Link (NWRL) its signature infrastructure project, then this report would probably have told the government not to build it. In fact, the NWRL barely even rated a mention in the report, potentially because it was originally only mentioned in the context that it should not go ahead, and when you got rid of all of that then there was nothing left to say. But what the report was able to say was that a Second Harbour Crossing is not needed, and won’t be needed for a number of decades. This puts is directly at odds with the Transport Minister Galdys Berejiklian and Transport for NSW, which argue that a Second Harbour Crossing should be the next project to commence once the NWRL is complete. The report points to the cost of a Second Harbour Crossing, which is estimated at $10bn, and argues that improved efficiency can increase the capacity of the existing crossing sufficiently to warrant deferring a second one. Strangely, it cites the large number of buses crossing the Habour Bridge (so many that more passengers cross the bridge by bus than do by train) as a success for buses, when the same fact could be used to argue that the rail bridge crossing is currently capacity constrained and that lack of capacity is flowing over onto buses, which have now also reached saturation point (as discussed earlier). This is a more complicated issue that it initially seems. For example, about half of the passengers who will use the NWRL are expected to travel to a destination North of the Harbour (i.e. North Sydney, St Leonards, Chatswood, Macquarie Park, Norwest). This does lessen the apparent need for a Second Harbour Crossing, and is why the government is able to build the NWRL first and the Second Harbour Crossing second, rather than the other way around. At the same time, that still leaves half of the passengers staying on through to the city. A Second harbour Crossing also has the benefit of increasing capacity into the CBD not just from the North, but from the South. A new rail line has been built through the CBD roughly every 25 years: the Harbour Bridge (1932), Circular Quay (1956), the Eastern Suburbs Line (1979). It’s now been 33 years since the last expansion of CBD heavy rail capacity, and probably another 2 decades before another one can be built. Postscript: It’s getting late and this post is getting quite long. There are other areas that probably deserve mention, but they are not as important, so in the interest of not turning this into a novel and I’m going to leave it here for now. Regarding Brisbane BRT capacity, the busiest point now sees over 400 buses in the busiest hour. I think the capacity is well over 9000/hr/direction. I think that the fact that Infrastructure NSW’s management board is loaded with representatives of the road freight transport industries may have influenced its findings. INSW may be independent. It is certainly not unbiassed. The credibility of its report is thus thrown into doubt. And why was State Cabinet so hasty to approve funds for the new motorway?.. Something is going on within the Liberal / National coalition. Congratulations on your website. Like you I find the INSW’s CBD bus tunnel idea an ugly solution and I hope it never happens. I note that Seattle has an underground interchange for light rail and electric trolley buses. Pulling Sydney diesel buses underground would be bigger problem. The figures quoted were quite a few years old and almost certainly are out of date (for Brisbane, I reckon it’s still the same for Melbourne). Though I would also point out that maximum capacity for buses is theoretically one bus every couple of seconds on open road, or around 70,000 passengers per hour. The problem occurs when trying to get them on or off the buses, as it requires large amounts of kerbside space (much more than vehicles on rail), and this bottleneck is not addressed by the CBD BRT tunnel. In fact, the bus tunnel provides less kerbside space than currently exists on the surface, so I can only imagine the problem getting worse. Unless buses are allowed to continue operating on the surface, which partly defeats the purpose of building the tunnel in the first place. It does provide for more road-space for buses, but it’s a very expensive way of achieving this. However, I think a bus terminal in the old tram tunnels at Wynyard (minus the tunnel to Town Hall) would definitely be welcome. It was an election promise to build which ever road project Infrastructure NSW recommended. It was also an election promise to build the NWRL. Everything else is up in the air, and depends on the Transport Master Plan that Transport for NSW is finalising by the end of the year. I think an underground interchange, where bus passengers can change quickly and easily (and without fare penalty) onto a train, is a much better solution that a tunnel connecting Town Hall to Wynyard. Yuck!! Who wants to ride around in some hot, filthy, disgusting polluted bus tunnel? Start laying light rail tracks in George Street!! How hard can it be?? Otherwise, without a light rail spine, there’s NO POINT HAVING ANY LIGHT RAIL ANYWHERE IN SYDNEY!!!!!! !